Is it time to show your savings some love? Check out industry super fund-owned bank ME’s five telltale signs that your savings could do with an uptick. If you’ve got nagging doubts that you could be saving more, you’re not alone. A growing number of Australians are concerned their savings are running low. ME’s latest Household Financial Comfort Report revealed that Australians’ comfort with their short-term cash savings fell to 4.93 out of 10 during the first half of 2018 – its lowest level in a couple of years. The thing is, if you don’t think you’re saving enough, then you probably aren’t. Are you on track to grow your savings? ME rounds up five classic red flags that suggest it could be time to start tucking away a little more. Who doesn’t love payday? But if you’re regularly sweating the arrival of your next pay cheque, it could be a sign that you need to take action – fast. Think about stashing some cash away at the start of each pay period. What’s left over is yours to spend; just don’t dip into your savings. ME’s free online school of money, Ed, has a useful module called ‘Budgeting’ that can help you learn about establishing goals, making a budget and putting good money habits into place. So much of our spending is digital these days and between buy now, pay later services like Afterpay and zipPay, and cash-free platforms like Uber, it can be hard to know where your money is going. Try tracking your spending for a week or two. Plenty of apps make it easy – such as ASIC’s TrackMySPEND – and chances are you’ll be surprised at how much money is flying out the door on unnecessary purchases which you could easily cut back. No one likes paying bills, but continually running late with regular household expenses can mean copping late payment penalties. Longer term, it could even damage your credit record. Growing your personal savings means not having to scrounge for cash every time a bill arrives. 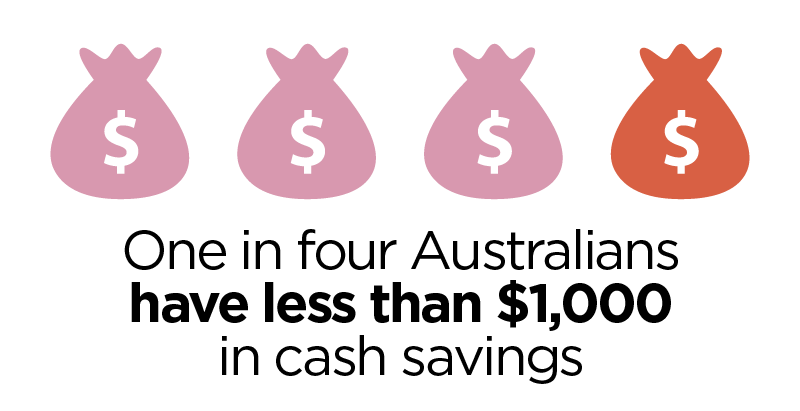 One in four Australians have less than $1,000 in cash savings, according to ME’s Household Financial Comfort Report, and that can turn an unexpected expense into a financial crisis. With the safety net of some savings, you’ll be free from worries about how you’ll pay for a new fridge when the old one conks out, or how you’ll afford the repairs your car needs to make it through rego. Barefoot Investor calls emergency savings the Mojo Bucket and recommends stashing $2,000 into it. Psychologists agree that setting a few personal goals to work towards can be a big motivator. The key is to make your goals measurable and achievable. Work out what you’d like to aim for – maybe a holiday, some new furniture or a first home. Crunch the numbers to know how much you need to achieve your goal, and then make it happen by deciding how much you can comfortably save each week, fortnight or month. Growing spare cash is easier when you approach savings on autopilot. Set up a regular transfer of funds out of your everyday account and into a savings account. You’ll be amazed at how quickly your savings build up behind the scenes.